You know that dizzying feeling when you start a new job and you are absorbing so much information as fast as you can and hoping you’ll have time later to sit down and sort through your brain? I feel like this is what we’re expecting of Zoe almost every day and because she has so many millions more neurons than I do firing at once, she’s able to handle it. At any given moment we are teaching her to read, write, brush her teeth, swim, have good manners, try new foods, have good social skills, how to be safe, and the answers to any of the hundreds of questions she asks each week. It’s no wonder she gets cranky sometimes. It’s a lot to take in. For our part as parents, it’s a lot to teach. The other day at the pool I met a mom with four kids who home schools them. I am amazed at people who do this. I would not have the patience or the energy. I don’t know how they ever get a break. And I feel like it’s emotionally, mentally, and physically exhausting to teach my daughter just those aforementioned things–the basics for living life and growing up and being a good person in society. And feeding that intellectual curiosity. It’s all I can manage. Sometimes it’s frustrating when you tell her something you’ve told her a thousand times before and you think she should know it by now or it should be obvious. But if I allow myself to stand back and think about everything she is taking in at more or less the same time, it’s not surprising that some of those tips would fall through the cracks. I like learning new things, but on a daily basis I usually encounter a lot of stuff I’m pretty comfortable and familiar with. I am impressed that Zoe can handle so many new things at once. So if she can manage to learn it all, I have to rise to the challenge of teaching it. We’ve been working hard on the dental hygiene front. Zoe recently started using big kid toothpaste and learning to spit it out. It’s kind of a challenge to get her to brush for two minutes instead of 20 seconds. We’re building up to it. 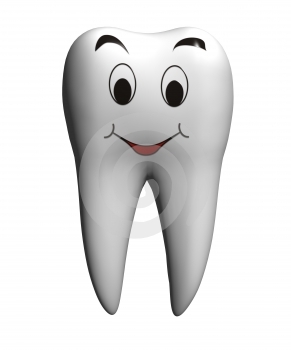 But she loves to spit, so she’ll be able to get a fluoride treatment when she sees the dentist in August. And now she has a mirror so she can easily admire her clean and sparkly teeth. This morning while Zoe was eating her breakfast I was emptying the dishwasher. 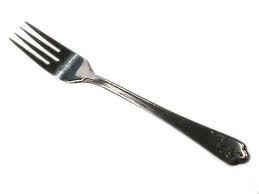 I dropped some silverware on my foot. She came running into the kitchen to see what was the matter. I sat down on the floor and she said, “let me bring you an ice pack.” And she brought me one from the freezer. “I used this one when I hurt my foot and it helped,” she said. Then she rubbed my back and made me a pretend cup of “warm, soft tea” to make me feel better, and wrapped a towel around my leg in case it was broken. She said I should pretend it was broken so I could use crutches. She brought me some plastic golf club crutches. If nothing else, she is a very sweet girl. We have a new system. We are using different language. We are hoping for a fresh start. Zoe is working on “being the boss of [her] body.” This is a concept I gleaned from re-reading the sheaf of papers that Terry Sink, the physical therapist who saw Zoe in Winston-Salem, gave us as we left her office. I know that Zoe is yearning for as much independence as a four-year-old can handle, and that the idea of being the boss of anything, especially her own body, is appealing. And much more palatable than being the object of frequent reminders that border on nagging by her parents. So being the boss of her body means that she does whatever she needs to do to take care of herself–taking her vitamins and medicine, using the bathroom when her watch goes off and when there’s an opportunity during camp or school and when a teacher or her parents suggest and when her body tells her to. And not arguing about it, which as of late has been the hardest thing. Her urologist believes the timed voiding–using the bathroom at least every two hours–is key to resolving her bladder issues, but we cannot control this. The best we can do is encourage. To the end of not arguing, we have added to this concept the idea of being the boss of one’s emotions as well. I have written before that Zoe’s been dealing with a lot of anger that I think has resulted from our increased attention to a problem she’s already fed up with and frustrated by. We have tried to communicate to her that it’s ok to get angry or frustrated but it’s not ok to take it out on us. I ordered a handful of books from Amazon as well as a relaxation cd for kids that involves guided imagery and muscle relaxation featuring sea creatures. And we’ve gotten advice from various professionals and parents about what resources to give Zoe so she can express and deal with her feelings in a constructive, or at least not hurtful, way. We’ve gone back to the always solid but sometimes hard to remember practice of active listening and echoing her feelings–the same technique that has been invaluable in keeping our marriage strong. “You are really mad because we have to leave the pool, aren’t you?” “You’re so frustrated that Daddy had to go to work because you were having fun playing with him.” It may sound silly but it always seems to help. She pretty much always says yes. That doesn’t mean she’s instantly happy or that the anger dissolves immediately, but she is usually thankful that someone understands why she’s upset when she can’t bring herself to articulate it. So we are trying this and encouraging her to express her anger and then move on, instead of having a fit. Meanwhile, she wants a bike. Do you see where this is going? Recently while Randy and I were at a concert, Zoe’s babysitter took her to the park and, to our surprise, helped her ride a bike (with training wheels) for the first time. Whose bike it was I have no idea. We had been toying with the idea of getting Zoe a bike for a while (and trying to decide between a balance bike, a regular bike, or a regular bike with pedals removed to make an ad hoc balance bike) but she hadn’t expressed a strong desire so we hadn’t really done anything about it. Since then Zoe has been very excited by the prospect of a bike of her own. So we decided to introduce a new system to give her a strong incentive to be the boss of her body and her emotions and be rewarded by a bike. A couple years ago we used a similar system, which we learned is called a token economy, to get Zoe to go to bed without a giant tantrum. Every night she cooperated she earned a paper loop, and after a certain amount of loops accumulated on her chain, she earned a treat. After several weeks worth of loops were hanging from her bedroom door, bedtime was a breeze. Or at least not an ordeal. So we have a precedent for this. Every day that she demonstrates she is the boss of her body and the boss of her emotions, she gets a poker chip at bedtime. 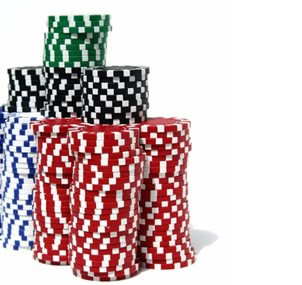 When she makes it to 30 chips, we will head to the bike shop. So far, six days in, she has 7 chips. She earned a bonus today because she made herself get out of the pool to use the potty, which she is usually loathe to do, and she did not make a scene when we had to leave the pool to go home. Earning a chip does not mean that she has no accidents, because we know it is not her fault when she has an accident. In recent days her accidents have been caused by politeness. She is in week two of art camp, and the bathroom there is down the hall and she is not permitted to go without an adult. Monday she said when she had to go the teacher was talking and she didn’t want to interrupt so she tried to hold it but couldn’t. I told her it was really nice that she was trying to be polite, but sometimes it was ok to interrupt, or that she could ask the helper to take her to the bathroom. Today she said the teacher and both helpers were all talking when she had to go. I reiterated that it is really ok to interrupt. It is hard to teach her so many things at once. I am so delighted that she’s trying to be well-mannered and respectful. But I don’t want that skill to be at the expense of her taking care of her body. So we’re rewarding for effort more than results, although we are confident that effort generally leads to results. Meanwhile, we are also planning a new tactic on the medical front. Zoe’s urologist has suggested that we try an anticholinergic, a medication designed to control the symptoms of overactive bladders in people of all ages. We also have a series of physical therapy appointments scheduled for her in August. So we have a new system at home, a new medical regimen on the horizon, and a new bike hopefully in the future. She had a really good day today, which means I had a really good day too. She’s had a few good days in the past week. It’s a relief to have a conversation that doesn’t turn into an argument. It’s a relief to see your child calm down in the face of a disappointment instead of blowing up. It’s a relief to be able to reward success, even if it’s not perfection. It is glorious to have a good day. When I lowered my voice in the library yesterday, it wasn’t because a librarian scolded me. Instead, it was because I was reading aloud to Zoe the book My Mom’s Having a Baby by Dori Hillestad Butler, and I was a little surprised when I got to the part where it describes explicitly how the sperm gets to meet up with the egg. I wasn’t surprised by how that happens. I’m aware of the process. I was startled by the fact that this book, recommended to Zoe by the librarian, included this description. The many other books we’ve read on the subject just say something along the lines of the mommy and daddy love each other, so the sperm meets the egg and they have a baby. Certainly this is vague, but it’s enough information for most preschoolers, I thought. So Zoe requested the book again at bedtime and her dad read it to her, although he had been forewarned by me. He reported that she didn’t ask any questions about the particulars. Perhaps there’s no reason why she would. She’s not a mommy or daddy and although she is aware of her own body parts, she knows that only grown-ups can have babies, not little kids. She still loves to pretend that she’s having babies, and that’s fine. I’m just hoping we can hold off on any detailed follow-up conversations for a little while longer. As a post-script, while we were on vacation Randy found, in the banned book section of a cool store called Malaprops, a great book for Zoe. And Tango Makes Three is the true story of a pair of male penguins who mated for life and adopted (with the help of their zookeeper) a baby penguin called Tango who they raised together. It’s a very sweet story. So at least Zoe is getting a variety of perspectives on how families are created. Countless are the conversations I have had with friends, colleagues, and the occasional stranger about the guilt that comes with leaving your child somewhere. Anywhere, really. Even if it’s the world’s best preschool, the most fun camp ever, or your parents’ house where you know your child will be showered with attention and snacks every moment that you’re gone. I have friends who work full-time and friends who stay at home with their kids. I have many friends who, like me, have their own businesses and work from home, so they cobble together some amount of preschool or day care or nanny sharing or babysitting or playdate exchanges so they can get work done, and do the rest of their work long after the kids are in bed, so they can spend more quality time with their kids during the day. Because this is the category I fall into, I have the most experience with it. I know, based on what friends tell me, that full-time working parents have plenty of guilt of their own, and stay-at-home parents are more likely to lean toward insanity than guilt. Most of these conversations lead to the conclusion that this guilt we feel is totally pointless. We are not abandoning our children on a street corner or locking them in the basement. We are finding safe, fun, stimulating activities led by nurturing caregivers so we can do the work we need to do to support our families and, theoretically, love to do as well. I love my work, and we need my income, along with my husband’s, to pay our bills. My daughter loves meeting new people, going new places, making friends, and exploring dance and art and her imagination. She loves her grandparents. She loves her babysitters. Sometimes she asks me, apropos of nothing, when a babysitter will come over to play. But it just takes one morning where she is clinging to me at drop-off, giving me one more hug after one more hug, plaintively whispering that she’s scared or worried or going to miss me, to squeeze my heart until it hurts. Not to mention that I seem to be the only mom left in the classroom while all the other kids are sitting cross-legged and attentive listening to the teacher. The teacher this morning was nice about it, telling me I could stay as long as I wanted. From past experience I know the longer I stay the worse it is. But she was trying to be helpful. I also know from past experience that Zoe is always fine within minutes of my departure, and has a great day the rest of the day. So today I sat in the shade on the steps outside the art center, taking deep breaths and repeating the mantra of “She’ll be fine.” And I’ve been thinking about her ever since. I don’t feel the same sense of despair I did last year during a particularly brutal period of separation anxiety in which I had to physically hand a crying Zoe to a co-oper in her preschool class in order to extricate myself from the classroom. I know she’ll be fine. And I know the situation is what it is. I work, she goes to camp, we’ll all be fine. Still, she’s the only kid in her age group staying for the whole day of art classes. And my dad has said to me a few times, why is all this necessary? What about lying around in the summer? But my mom didn’t have to work. And I do. It is what it is. Zoe will be fine. My real job is keeping the guilt at bay. I’ve been to Graceland and what impressed me most there was really the comprehensive nature of the gift shop–down to the Elvis-themed toilet paper. 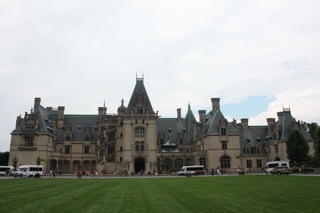 But last week I visited the house to conquer all houses–the Biltmore. Finished in 1895 and opened to the public in 1930, Biltmore House was the summer home of George W. Vanderbilt, whose descendants still own the estate and employ 1800 people to run it. The home has 250 rooms, 43 bathrooms, and sits on 8,000 acres. That’s about half the size of the entire county where I live. The Biltmore website suggests buying a two-day pass to take in all the sites, which I thought was just a marketing ploy, but I really could have spent two whole days there if I had planned for it. The tour of the house is impressive and the audio tour well-done and very informative. My dad and husband and I were rattling off Biltmore trivia to each other and the rest of the family for several days afterward. The banquet hall looks like something out of Harry Potter. Vanderbilt collected Napoleonica and Napoleon’s chess set is on display, and you can visit Vanderbilt’s and his wife’s bedrooms, joined by a sitting room where they breakfasted together. I learned the role of the valet was critical because individuals changed clothes six to eight times per day, depending on what activities they were doing. Vanderbilt was a visionary in terms of modern amenities. He had electricity, an indoor heated and underwater-lit swimming pool, a home gym that would still be useful today, and the first bowling alley in a private residence. The unfinished music room was used to hide valuable art from the National Gallery of Art during World War II. The house was designed by Richard Morris Hunt and the grounds by Frederick Law Olmstead, who also created Central Park in New York and the US Capitol Grounds, among other environments. In addition to the house itself, which features gargoyles and stonework to rival the National Cathedral, the gardens surrounding the house and throughout the estate are absolutely beautiful. I imagine many of those 1,800 employees are gardeners. 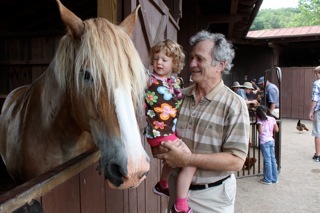 And the estate includes Antler Hill Village, which features exhibits, a winery, shops, restaurants, and a farm and barn with old-fashioned toys, carriages and tractors to climb on, and performances by musicians and storytellers. We heard a 14-year-old self-taught banjo and guitar prodigy play. He said he couldn’t read a note of music and had been playing for just a few years. If you closed your eyes you would have thought it was Ralph Stanley playing. Zoe was captivated by all the toys. I enjoyed the shade in the barn while she played. 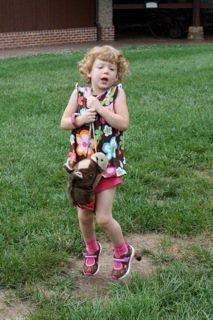 She rode a hobbyhorse around and around, then patted the mane of a real one. 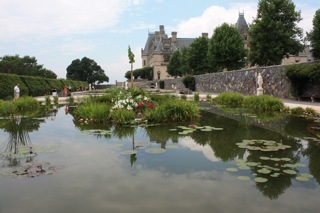 Our trip to Asheville was lovely overall, but our visit to the Biltmore House and estate was definitely a highlight. As I was sitting at the table mildly yelping in pain and clutching my shoulder where a vengeful yellowjacket had just stung me twice, my husband was busy looking up remedies on his smartphone. We were packing the car to leave the log cabin we’d been renting for a week with my family on the outskirts of Asheville, NC when I was stung. A wasp had easily sneaked in through the front door as we were going in and out loading luggage into the minivan. Randy tried to shoo it out, whereupon it must have signaled (he discovered online) to his friends to come rescue him or at least inflict harm on his attackers. So suddenly I was stung. My daughter was stroking my hand. She made me a get well card within moments of the sting. My mom, aunt, and cousin all looked for baking soda to mix with water and apply to the sting site. There was none to be found. 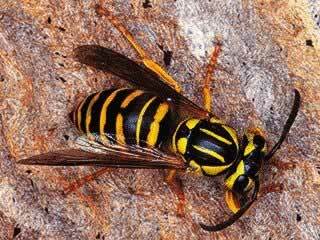 They also looked for a stinger to remove, but apparently wasps (of which the yellowjacket is just one variety) do not leave their stingers in place, nor do they die after stinging, as bees do. Other remedies Randy read about: toothpaste, which my mom produced and someone rubbed on me. Cortisone, which we always have on hand because Zoe has always been particularly tasty to all forms of insect life. The toothpaste and cortisone didn’t seem to do much. Ice was applied, and at least distracted me for a while. He also read about the possible healing powers of aloe, crushed fresh basil, mud, and chewed-up tobacco. We didn’t have any of these on hand. I opted for ice and tylenol and was relegated to the back seat for the first leg of the trip, instead of driving. We stopped for lunch and a drugstore where we found some aloe-based medication for wasp and other nasty stings. We also got some antiseptic to clean the sites (better late than never, right?). Randy read that you’re supposed to get a tetanus shot if stung by a wasp. Luckily I had just had one last week. Coincidence? Nurse Randy cleaned and medicated my arm in the parking lot of Sonic in Pulaski, Virginia, and I got to sit in the front seat for the rest of the ride, although I still wasn’t allowed to drive. Fortunately my arm is all better now. I was thankful that the creature didn’t get Zoe. I would have been less calm. It wasn’t pretty. But now we know what to do. Grown-ups need tetanus shots, even if they have not stepped on a rusty nail. It’s really cool to watch a butterfly emerge from its cocoon. When they come out, some red liquid comes out, but apparently it’s not blood. Growing cucumbers in a pot requires tomato cages for the vines to wrap around. Cucumbers grow very quickly and produce voluminous vines. When you go to discount shoe stores, all you find are cheap shoes. So you end up going to the real shoe store to find what you want anyway. Apparently a pair of sneakers your child wears out of the house one day can actually disappear.